Ascorbic Acid Colorimetric Assay Kit II (FRASC) | K671 | BioVision, Inc. The assay can detect 0.2 to 20 nmol of ascorbic acid in various samples. Ascorbic Acid (Vitamin C) plays an important role in many biological processes. It is a potent anti-oxidant, anti-inflammatory, anti-viral agent and an immune stimulant and is present in a wide variety of biological specimens. Due to the presence of a variety of other antioxidants in biological samples such as serum, most ascorbic acid assays show strong interference. BioVision’s FRASC Assay Kit provides a rapid, simple, and sensitive means of detecting ascorbic acid in biological samples such as serum and other body fluids, tissue and cell extracts, growth media and food products. In this assay, Feᶟᶧ is reduced to Fe²ᶧ by any antioxidants present. The ferrous iron is chelated with a colorimetric probe to produce a product with a strong absorbance band which can be monitored between 545-600 nm. 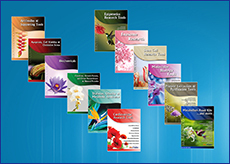 The addition of ascorbate oxidase to parallel samples removes any ascorbate present leaving a background value which is subtracted from the total to give ascorbate content. 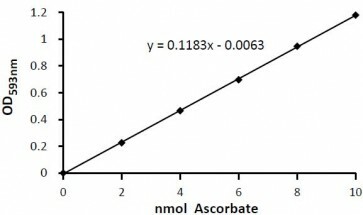 The assay can detect 0.2 to 20 nmol of ascorbic acid in various samples. Would your kits K661-100 or K671-100 be suitable for measuring ascorbic acid levels in blackcurrant juice? The juice itself has quite a strong colour. Even with diluting it down, would you know if one of these 2 kits could be suitable? K661 and K671 measurements are in the yellow-orange range of the spectrum (545-600nm). There could be some interference from the blackcurrant juice in this range but you can run parallel controls and subtract the background to get the final numbers for your assay. So either one of these could work. K661 allows both colorimetric and fluorometric measurements and K671 allows only colorimetric measurement. I would recommend not using the fluorometric version of the assay since it is 10-100 fold more sensitive and the background color intereference may be more pronounced in this case. Could results be low depnding on how the samples are prepared? Ascorbic acid is unstable and very easily oxidizable, especially if there is time lag in preparing samples for the assay. It is essential to work quickly and keep sample vials closed as much as possible to prevent air-exposure. This could be the reason for low amounts of unoxidized, free ascorbic acid detected in the samples. The OD values are beyond the std curve highest point. How can I calculate amount of Ascorbic acid from this Std. curve? If the OD values from your samples are higher than the linear range of the assay, then you might not get the expected values. There will be underestimation because the std. curve can only correctly predict calculations within the linear range. You might need to dilute the samples and then try again. We recommend taking one or two representative samples and using different volumes to make sure the values are within the linear range of the std. curve. Sage et al., Human erythrocytes transport dehydroascorbic acid and sugars using the same transporter complex. Am J Physiol Cell Physiol, May 2014; 306: C910 - C917. Theodorou, A. A. et. al. No effect of antioxidant supplementation on muscle performance and blood redox status adaptations to eccentric training. Am J Clin Nutr, Jun 2011; 93: 1373 - 1383.